The fourth-largest island in the Bahamas, Grand Bahama is blessed with glorious white sands, championship golf courses, a slew of international restaurants, casinos and reefs teeming with tropical fish and other sea life. Each day, parents have to make the hard choice of whether to bring the kids over to greet the dolphins, snorkel, sea-kayak, shop or simply hit the pools and beaches. If the stretch of beaches happens to be a 7.5-acre gem of pearly white coastline — like the one Grand Lucayan has at its doorstep — then you have all the makings of a fabulous family retreat. 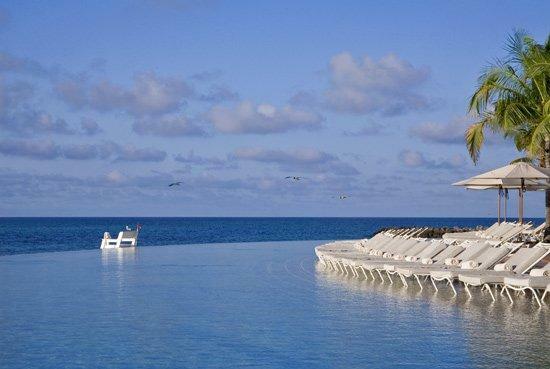 First opened in 1998, the Grand Lucayan is a mega-resort with a confusing number of big-name hoteliers attached to the destination. First, Sheraton came on and opened an Art Deco, hexagon-shaped structure that houses more than 500 rooms. Several years later, Westin took over a quiet corner of Lucaya Beach and opened three sets of accommodations — a large, ten-story, S-shaped building called Breakers Cay; the lowrise Lighthouse Pointe; and the two dozen or so two-bedroom suites that make up The Lanai. In 2009, Radisson purchased the Westin section of Our Lucaya and its 740 guest rooms and the Sheraton half of the property was called The Reef. 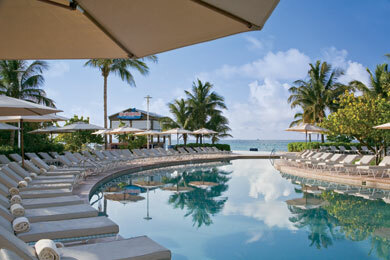 Today, Grand Lucayan is a multi-building property. 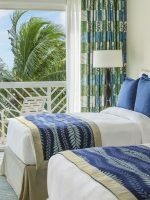 Grand Lucayan is set on 7.5 acres and features 542 hotel rooms, including 25 one- and two-bedroom suites. Besides its ideal setting atop one of the finest stretches of coastline in the country, the resort boasts three pools, a golf course, tennis courts, nine restaurants, a 25,000-square-foot spa and fitness area, and shopping at the nearby marina. So you’ll have more than enough to keep you busy, whether you’re on a quick, four-day jaunt or weeklong getaway. Most of the rooms in Grand Lucayan have ocean views, but make sure to request one, or you could be stuck looking at the garden. The standard size is 400 square feet, which is spacious for a hotel room. However, the 1,000-square-foot family suite was hard to resist for our family of four. There's a large master bed and an additional room with a sofa that pulls out into a double bed. There was more than enough closet and drawer space for our clothes, and with the help of a balcony that peers out over the aquamarine waters, we didn't bump into each other that often . The room is decorated in Caribbean blues and whites, adding a gentle touch. There's a small kitchenette with a refrigerator to stock water and other drinks and a microwave to heat up last night's leftovers for lunch. 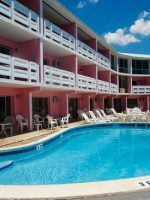 There are also bath robes and hair dryers to use in the large bathroom, Wi-Fi in the room (for an extra charge), flat-screen televisions with a good range of cable channels, a coffee maker and 24-hour room service to order anything your little heart desires. Overall it was a good experience. It was in a convenient location and the pool was nice. They had an unusual plus of a 25 meter lap pool with only two lanes. I actually was able to do a daily 1/2 mile swim while staying there. The rooms were good but unfortunately, the larger building in the resort was closed after hurricane damage. I suspect that there will be renovations in the future. While staying there I strongly recommend visiting the superb restaurant. We explored almost the entire island from East End to West End. Had a great time, enjoyed The Stoned Crab restaurant, awesome food and service. Beaches are very clean, local people are so nice, Enjoyed The Garden of the Groves also. Beautiful foliage, tropical flowers, Downside, all things 12% VAT. The energized staff keeps guests as busy as they want to be around the three pools, which include a lap pool and an infinity pool. 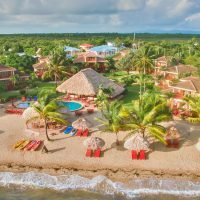 Partake in a game of lawn croquet, coconut bowling, pool volleyball and basketball games, shuffleboard, scavenger hunts and long morning walks. 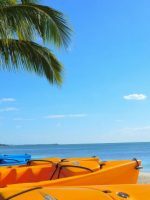 Down on the beach are all of the requisite water sports like kayaking, windsurfing and sailing. The newer Robert Trent Jones, Jr.-designed golf course features many holes along the coast in a par-72 course. 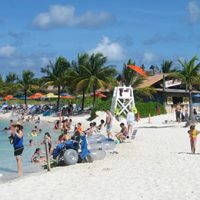 Nearby, the Port Lucaya Marketplace is a collection of 80 boutiques, restaurants and bars that get busy later in the afternoon when the day starts to cool down. It's is a good place to find Bahamian straw hats, bags, jewelry, perfume, designer clothing and other souvenirs. This is also home to the UNEXSO Dolphin Experience, where, for a price, kids and their excited parents stand in the shallow water and see dolphins do tricks. Afterwards, you might get to pet the docile creatures and take photographs. Drive to the West End of the island to snorkel along the reef and visit the 11-acre Garden of the Groves. This small tropical paradise is perfectly landscaped with waterfalls, flowering shrubs and some 10,000 trees. To get deeper into the mangroves, go on a guided sea-kayaking tour with Kayak Nature Tours. You might spot hummingbirds, warblers and herons in the lush environment. Grand Lucayan features nine restaurants that range from local Bahamian to American to West Indian cuisines. For breakfast, visit Willy Broadleaf for all-you-can-eat international cuisine. 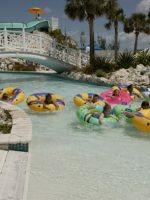 The kids liked floating over to the swim-up bar, Hammerheads Beach Bar, for their choice of virgin banana daiquiris or pina coladas. At night, China Beach is a sushi bar overlooking the ocean, while China Grill features your usual array of Chinese fare. Far more upscale dining can be had at Churchill's. Enjoy a Mediterranean-inspired kitchen while a piano player tickles the ivory in the background. Irie's serves up traditional Caribbean dishes and seafood, including a lobster dish soaked in rum. Afterward, mom and dad might want to wander over to the Havana Cay Cigar Bar for a Cuban smoke and a splash of cognac. Off-property, Giovanni's Cafe, in the nearby Port Lucaya Marketplace, has a good selection of pasta and Italian-inspired seafood entrees. Another good seafood option, known for its fresh catch, is The Stoned Crab, which overlooks Taino Beach. Finally, have breakfast at Becky's in Freeport, where families go to dine on pancakes, eggs and johnnycakes. The Fitness Center has daily aerobic and yoga workouts. At the Senses Spa, indulge in the signature treatment, Bahamian Wrapsody, where a lime-juice exfoliation leads to an aloe, rum and spice body wrap. Then there's the Vegas-style casino, which features 400 slot machines and 30 gaming tables. Fifty-five miles off the coast of Florida, expect Grand Bahama Island to have the same weather patterns. It could still get a bit nippy in November and December, but January through April are ideal, and hurricanes can definitely hit in late summer. 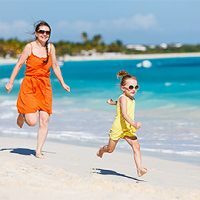 Like most of the Caribbean, prices are significantly reduced at the Grand Lucayan after mid-April but return to high-season rates again in late December. Guest rooms with ocean views start at $279 in the shoulder season. The Family Suite begins at $450 a night and is worth the splurge. 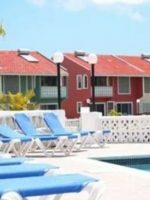 This includes use of all amenities on the property.